Before I tie too much money in inventory making up gold jewellery and having it not sell, I am wondering about customer expectations of gold alloy colour. Each colour of gold whether yellow, white or rose can come in a range of shades. In yellow gold we can have medium yellows, lighter and brighter greener yellows or even darker, richer reddish yellows. Which colours do customers prefer or is the difference negligible? For white gold, I assume the whiter the better and in this instance I would think a high palladium content is best to avoid the brown that comes from low pall. content or yellow from low nickel content (high nickel alloys are sensitive for allergies and hard to work) As for rose gold, it is best to avoid too high a copper content lest the working properties suffer particularly in 18K. However do customers expect a deeper more coppery red? 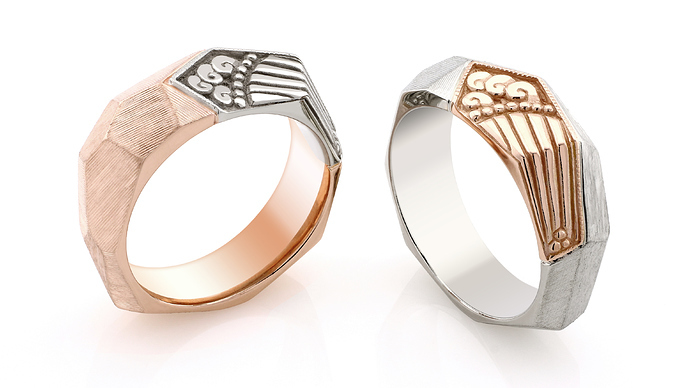 Would a customer object to lighter and peachier rose gold with a higher silver content? I worked at a mom-pop jewelry store for a bit as a sales person. YMMY, but the vast majority of our customers wanted & purchased white gold (rhodium plated of course). As far as yellow gold, I would say 95% of our customers couldn’t tell the different between 14k, 18k or 10k yellow gold; they shopped by the price point. When customers would bring in their jewelry to sell for cash, explaining to them how the spot price is not what you get for your gold jewelry and what those numbers mean on the piece, was the first time they were educated on what an alloy is and all the nuances of alloys. It really depends on who your target customers are, where you are selling and what you want to do artistically as a jeweler. The colors of metals look most intense with a softer satin finish. Especially when you have more than one color on one piece. The rings shown have both high polish and florentine finishes and are 18kt with no rhodium or rose gold plating. Great pieces, and that is with standard 18K rose with 5% silver and a high palladium white? I have no idea. We just buy the pre-made alloys from our local refiner. When we return our shop sweeps we always ask for pure gold back rather than money. We then alloy our metal as we need it with pre made alloying grain.